As part of the annual subscription fee you get access to free technical support and advice from the EOS editorial and lecturer team. So whether you have a burning question about your camera or a query on your photography, we are here to listen and to help. The advice service is available by telephone and email. Please quote your subscription postcode when accessing the service so that your subscription can be verified. 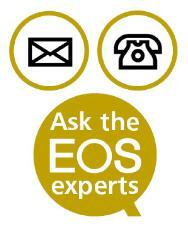 Join today and, in addition to the free advice service, you'll receive four issues a year of EOS magazine, access to the free classifieds service, plus exclusive offers and discounts on other EOS services.